Your radiator is full of fluid, called antifreeze or radiator fluid, which aids in cooling your vehicle’s engine. The coolant cycles through the radiator and engine. When heated fluid reaches the radiator, it cools down, and as it moves through the engine, it heats up again and the cycle continues. Over time, radiator fluid breaks down, which means that it loses its cooling capability. Fortunately, vehicles can run on the same radiator fluid for years on end, and for thousands of miles. How Often Should I Get My Radiator Flushed? Radiator flushes should be performed regularly, although they don’t need to be performed with the same frequency as an oil change. The frequency at which you should change your radiator fluid depends largely on the type of vehicle you are operating. For instance, some vehicles, like many models made by Subaru, the recommended replacement period is over a decade in time or over 100,000 miles driven. Ford vehicles, on the other hand, may need a flush every 50,000 miles. Take a keen look at your owner’s manual, or consult your mechanic to settle on the best practice for your specific vehicle and engine. What Are Some Common Radiator Problems? Radiators protect your vehicle, so a problem may put your vehicle out of commission. Don’t drive your auto with an overheated engine; be mindful of the temperature gage as you drive—do not let it reach the red portion of the gage. That said, there are a number of issues that can cause your radiator to malfunction and your engine to overheat. Here’s our list. Bad Temperature Gage: Your temperature gage should be accurate. If you have a gage that doesn’t show any heat in the engine (even after running the engine for 10 minutes), it’s likely that your temperature gage is broken. Your gage may also get stuck showing a high temperature. Regardless, you’ll need to fix the gage so that you can monitor your engine temperature down the road. 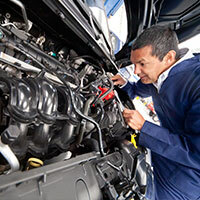 Take your vehicle in to your mechanic for a replacement; this is a relatively inexpensive fix. Bad Hoses: If you have hoses that are leaking or kinked, your radiator may overheat. Low levels of fluid will cause a temperature spike, and reduced flow will do the same. Again, this is a relatively inexpensive repair. You may be able to see kinked or leaky hoses. Take a look for dripping radiator fluid if you suspect that you have a bad hose. You may also notice an odor and steam if your fluid is leaking onto the engine. Cracked Radiator: If your radiator has cracked, you’ll need to replace it. This is a more expensive fix, since the whole radiator will need to be removed, replaced, and installed. A cracked radiator will also leak, which will cause overheating. You may see steam and smell radiator fluid once your radiator cracks. Bubbles in the Line: A radiator line should be free of bubbles. Air actually reduces the efficiency of your radiator. You may have to have your radiator line bled if you have air pockets throughout the line. This procedure is not expensive. Broken Water Pump: If your pump isn’t working, the fluid won’t flow as needed. Instead, cool antifreeze will remain in the radiator, while hot antifreeze remains in the engine. Once again, your engine will overheat. Replacing a broken water pump will usually cost between 300 and 750 dollars, due to the amount of labor necessary to remove and replace the pump. Bad Fan: Your radiator relies on a fan to pull air through your radiator fins (which cool the fluid). If you have a broken fan, your vehicle is more prone to overheat. You may notice that your vehicle overheats while idling, yet it remains cool when you reach higher speeds (since the airflow caused by these speeds is sufficient to cool the radiator fluid). The cost of replacing a radiator fan is similar to the cost of replacing a broken water pump. Fluid Obstructions: Whether caused by particles or pinched pipes, an obstruction within your radiator line can damage your pump and cause the coolant to seize. Your engine can release various particles as it runs, and these particles can make your radiator fluid more viscous. Eventually, with enough build-up, your radiator can malfunction and fail to cool your engine. What Happens to an Overheated Engine? If your engine overheats, you could be looking at some major irreparable damage. You can burn your exhaust valves, warp pistons, crack cylinders, and more. If you’ve overheated your engine to the point that it shut down, it’s likely that you’ve done serious damage to your vehicle. Don’t let your engine go this far! Simply shut down your vehicle if your engine overheats. Have it towed to a mechanic to ensure that you don’t overheat the engine while in transit. What Happens If You Overfill Your Overflow Tank? If you’re pouring radiator fluid into your vehicle yourself, be cautious to keep the fluid level between the minimum and maximum fill level. While overfilling your radiator isn’t a huge issue, it will cause a spill and it may cause your fill cap to shoot off. Excess radiator fluid will pour out. The issue with radiator fluid is that it expands when it is heated (which it is every time you turn on the engine). That expansion can cause your radiator to spill over, which is damaging to the environment, and it is poisonous to animals—be sure to clean up an antifreeze spill, the fluid is poisonous, yet it has a sweet taste that can attract pets and other animals. What Radiator Fluid Do I Need? Take a look at your owner’s manual to find out which antifreeze is best for your vehicle. The optimal antifreeze will be best for both your vehicle and the climate where you’re driving. In warmer climates, you’ll need more cooling power, whereas in colder climates, your antifreeze will need to be formulated to keep from freezing on colder days. 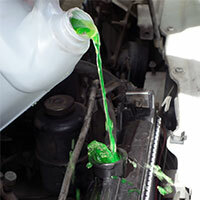 Regardless of the fluid that you choose, be sure that the radiator fluid is properly mixed. Some formulas come premixed with water—these will be labeled 50/50 or premixed. Other, concentrated antifreezes will require mixing with water—be sure to follow the instructions on the label to make the right mixture for your radiator. 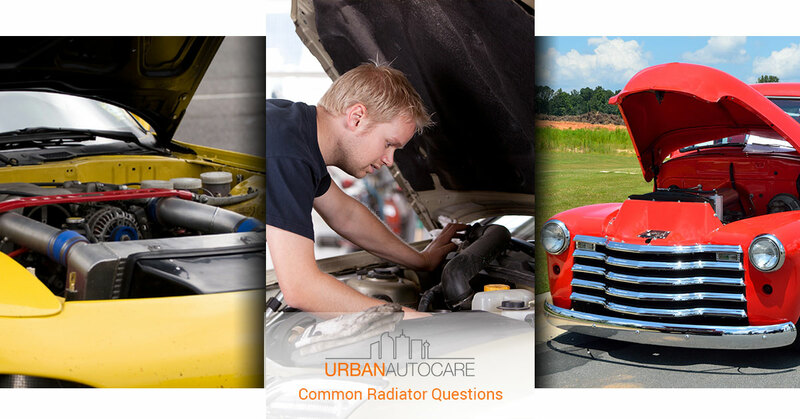 For the rest of your questions and radiator care needs, count on the pros here at Urban Auto Care. We’re here to make repairs when your car quits on you. We’re here for your regular maintenance needs, like when it’s time to bring your car into the shop for a radiator flush. Our mechanic shop is conveniently located right here in Uptown. Schedule service for your car today!